As a fulltime freelance blogger and journalist, I have a unique perspective on which items would make the best gifts for writers. When it comes to gifts, we freelance writers are pretty grateful for just about anything our loved ones buy for us. I love when somebody buys me a gift card for Starbucks!!! I spend so much time there each week because I need to get away from my home office. I know of a lot of other writers who do the same thing — especially freelance writers like me who usually work from home. Sure, it’s nice to work from the couch, on the porch, or in bed, but writers like working away from home sometimes, too. My local Starbucks is one of my favorite places to spend a few hours writing drafts, working on projects, or going through email. Plus, I love chatting with my favorite baristas and getting to say “Hello” to a few new folks, too! Chances are the writer in your life also enjoys hanging out at places like Starbucks. Find out what their favorite coffee shop or tea lounge is and pick up a gift card for them. It’s a thoughtful gift that will surely make their day! As a writer, almost every time I go to Starbucks, my computer comes along with me. I can’t imagine how difficult my trips to Starbucks would be without carrying my computer in a computer bag — because writers carry around much more than just a computer! I don’t even want to think how awkward it would be to carry around all of those items in anything but a computer bag. Computer bags are some of the best gifts for writers on the go, because they can keep their laptop and other essential items in a single convenient carryall. That means your writer friend can take their work virtually anywhere they want to go without missing a beat! Here is some great advice for choosing a laptop bag. You might also consider gifting your favorite writer with a laptop backpack — which essentially works just as well as a computer bag and can be used for other purposes, too. Most of us call our portable computers “laptops,” but how long can you comfortably use a laptop computer on your lap? Oh, sure — it gets the job done. But I find it pretty uncomfortable to have a hot, flat piece of metal or plastic on top of my legs for hours at a time. So, was I ever grateful when my fiancée bought me a laptop padded lap desk with foam-padded supports that make it much more comfortable for working with a laptop while sitting in a chair or relaxing in a recliner. There’s a wide range of padded lap desks available — and they’re relatively inexpensive. This is one of the best gifts for writers who work long hours on a laptop computer! I usually work 50 to 60 hours per week and have 7 to 10 projects due each week. My work includes a lot of quick-turnaround assignments (such as news stories) and a few long-term projects (like the latest book I’m working on). The only way I can juggle so many tasks at one time is to know which assignments (or projects) benchmarks are next up on my docket, and when they are due for completion. That’s exactly why my weekly planner is one of my very best friends. It’s definitely one of the best gifts for writers who need to stay organized. There are hundreds of different types of weekly planners to choose from — all of them work more or less the same way. For you, the fun part is choosing a weekly planner to suit the personality of your favorite writer! Every writer loves reading a good book or magazine. It’s even nicer when that book or magazine can help you become a better writer! I love the annual Writer’s Market guide, a book that lists publishers and literary agents, provides tips for writing query letters and proposals, and also explains what writers need to improve their odds at getting their submissions read by publishing companies, magazines, and journals. I also enjoy Writer’s Digest, a magazine published 8 times per year. It’s always chock full of the latest approaches and strategies for getting published, writing tips, and interviews with top writers, editors, and other literary movers and shakers. There are many other good books and publications out there, too. Whatever you choose, you really can’t go wrong with a gift that helps your favorite writer perfect their craft! Even though I mainly use my laptop for writing assignments, I still keep notebooks and high-quality pens nearby — I use them daily for recording quotes and comments during interviews. I also write notes while working on rough drafts, going through edits, and brainstorming new ideas to avoid writer’s block. Spiral-bound notebooks are pretty cheap, but I don’t scrimp on pens! A poorly made pen is really hard to use — if the ink skips on the ballpoint tip or the pen’s rollerball sticks, I have to go over my notes again. Here’s a freelance writer’s take on the 8 best best pens for writing. If you want to go fancy, then buy a nice journal book for your favorite writer. And my recommendation for a nice pen: buy a Cross. I’ve found that Cross pens write consistently well, can be refilled with ink, are made with high-quality materials, and last virtually forever! Would you believe I’ve already been gifted with a typewriter — not just once, but twice? While laptop computers are pretty efficient for writing and uploading assignments via email or the Internet, there’s still a certain charm to writing on a typewriter. Actually, using a typewriter is how I got my start in professional writing in the 1980s and early ’90s. And, I’ll give the typewriter this, too: some of them never need to be plugged in to operate! New typewriters are getting more difficult to find these days — but they’re still around. There are also many vintage typewriters looking for a good home. 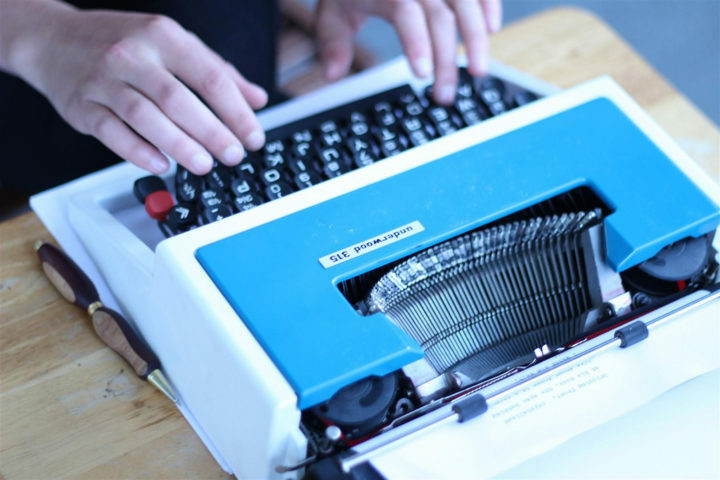 Whether you buy a new typewriter or opt for a vintage one from an antique store, flea market, or garage sale, you really can’t go wrong. Typewriters are the best gifts for writers who cut their writing teeth using them (as I did) long ago or who enjoy retro items and antiques.